Breakfast is the most important meal of the day. Dito mo dapat kunin ang sustansya na gagamitin mo para sa buong araw. Sabi nga ng mga health experts, breakfast should never be missed. Gladly, I am being invited to come and partake for a breakfast party on March 24. 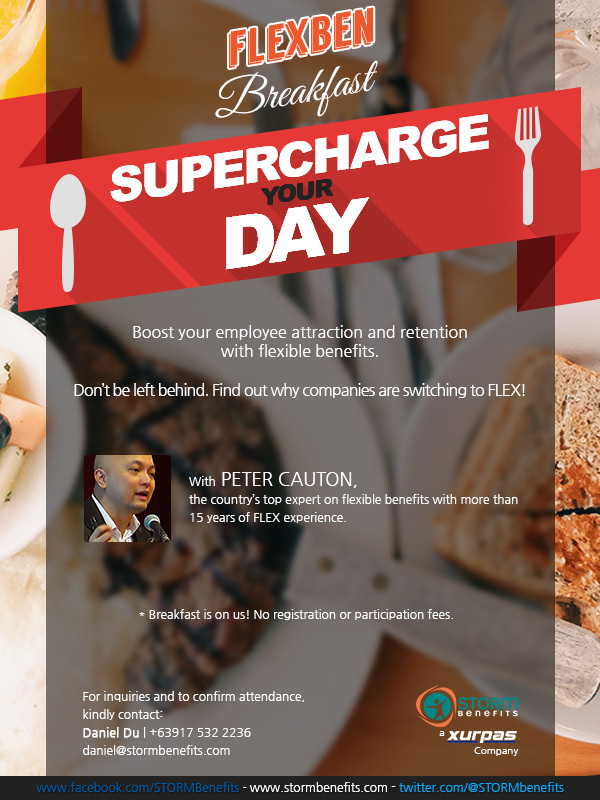 Storm Benefits will be discussing their latest practice in employee benefits and rewards. 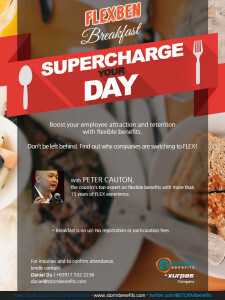 Their Flexible Benefits (FlexBen) Breakfast will help Human Resource people, CEOs, and COOs, to be more flexible in rewarding their rank and file. Alam naman natin na Happy People will generate Happy Stakeholders. And yes, Breakfast is FREE! A good friend Harry wanted me to come. If you would be interested, then drop your comment in and I would love to hook you up. You may also send harry an email (harry@stormbenefits.com). Just put in the subject line; Referred by Kampeon. This entry was posted in Tip lang, Trabaho and tagged Astoria Plaza, breakfast party, FlexBen, Flexible Benefits, free breakfast, Ortigas. Bookmark the permalink.